Verge Ora Vape is by the house of Godfrey Phillips India, which is a flagship company of Modi Enterprises. The company also has an international division that caters to foreign markets. With Verge Ora Vape GPI intends to offer Indian adult smokers an alternative to conventional combustible cigarettes in the form of Verge Ora e-cigarettes. The brand has various vape products, and their latest offering is Verge Ora Vape Pods which is a Pod based vaping device designed to offer ease of usage, portability, and quality vaping experience. Verge also has other vape devices and e-liquids as part of their portfolio. 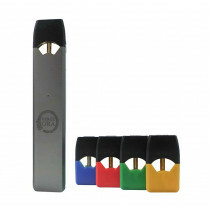 Top Verge Vape products such as Verge Ora Device, Verge Ora Pods that come in four flavors, i.e. Mango, Tobacco, Menthol, and Fruit Mix, and Verge e-juices such as Caramelt, Summer Fling, and Bahama Mama are now available at Vape Stop. You can buy Verge Ora Vape Pods and Verge e-cigarettes online with cash on delivery and prepaid option, 60 Day Warranty, and Same Day Dispatch.